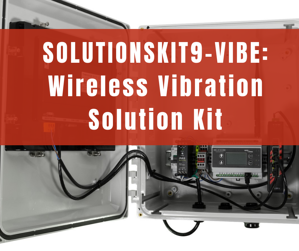 The SolutionsKit9-Vibe is a variant of the generic Wireless Solution Kit, specifically designed and programmed to suit vibration monitoring needs of equipment such as pumps, fans, motors, etc. The Vibration Solution Kit is fed with data collected from vibration sensors that is aggregated at the DXM100 wireless controller and then displayed at the HMI screen. The HMI allows users to carry out a visual analysis of the data, and if required transmit it to a cloud analytics engine where further processing can take place. Furthermore, the solution kit automatically establishes baselines and triggers for warnings through inbuilt machine learning algorithms, fulfilling the demand for predictive maintenance. The entire system is housed within a polycarbonate enclosure making it compatible with harsh industrial environments, while a Lithium-ion battery serves as the secondary source of power.